A GoFundMe page has reportedly raised more than $20 million for the project. 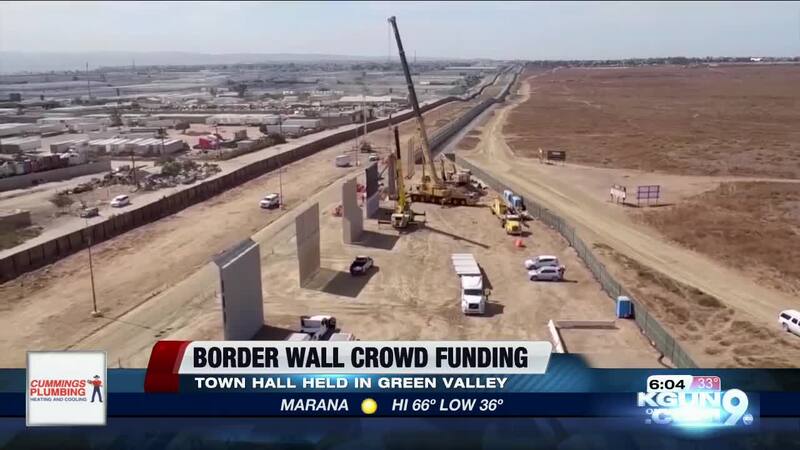 TUCSON, Ariz. — Leaders of a group hoping to build their own wall on the U.S.-Mexico border has plans to discuss the project with the public in southern Arizona this week. Leaders of the group "We Build The Wall" say they're holding a town hall Friday at 6:30 p.m. in Green Valley. Those leading the discussion include Brian Kolfage -- a triple-amputee combat veteran and the group's founder -- former Colorado Congressman Tom Tancredo, and former White House Chief Strategist Steve Bannon. The event is being held at the Quail Creek Republican Club. The group started with a GoFundMe page aimed at raising $1 billion for President Donald Trump's promised border wall -- a lofty goal. Since then, the page has raised more than $20 million, despite a few hiccups in the process. After its first round of donations via the crowdfunding website, "We Will Build The Wall" found it was legally unable to donate its millions to the government with a guarantee that the money would go toward a border wall. Instead the group decided to form its own organization and spearhead the wall construction itself. As it turned out, that was a violation of GoFundMe's terms. Because the funding was going toward a different organization than initially promised to donors, GoFundMe said it was required to automatically refund that money . The site did offer an "opt-in" option to donors to keep their money with the new organization. "We Build The Wall" claims most of its donors did just that.